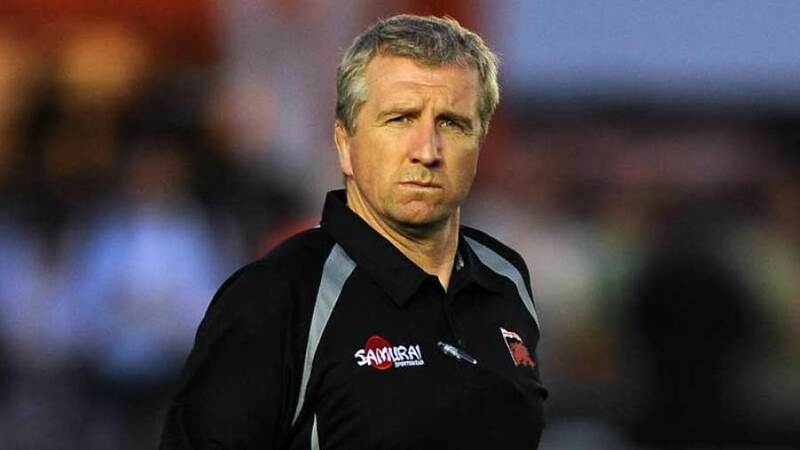 Amid reports Lyn Jones is one of the favourites for the Gloucester job, Dragons CEO Gareth Davies is adamant Jones and his assistant Kingsley Jones will be staying at the region. Nigel Davies' sacking on Monday prompted the usual rumour mill over just who will be Gloucester's new coach. Lyn Jones was mentioned alongside ex-Springboks coach Nick Mallett as a contender for the role but Davies is confident the Joneses will be staying at Rodney Parade. "Both Lyn and Kingsley are contracted to us and they have set out their stall in terms of their long-terms plans and aims for the region," Davies told the South Wales Argus. "Lyn has frequently talks about turning the Dragons into a serious entity over the next three or four years and I am confident he will do that." While Davies left on Monday, it was announced on Tuesday defence coach Paul Moriarty was not having his contract renewed at the club. Shaun Edwards has been mentioned as a possible replacement but one man who has expressed his eagerness for the post is ex-France coach Dave Ellis. "I spoke with Nigel Davies when he first took the job and was looking for a defence coach and there have been a few conversations during the time he has been there," Ellis told the Gloucester Citizen. "I've looked at the options and things are going well in France but it is always good to be back in the Premiership. I'm still very much interested and there have been a few conversations but I have been busy with Lyon who have just won promotion to the Top 14. "There have been a few messages since the news of Nigel leaving, which I am just sorting through. The timing is right for me, the team is exciting and there are new players coming in that will give them an edge in the forwards." Scrum Sevens: Who will replace Nigel Davies at Gloucester?